Sweet, purplish-black blackberries are closely related to the raspberries they resemble, but are a different fruit than black raspberries. The largest of the wild berries, blackberries are also commercially cultivated with 85% of the U.S. crop grown in Oregon. Also called brambles due to the prickly shrubs they grow on, blackberries are in season May through August. They’re delicious served on their own with a little sugar and cream, baked into pies and cobblers, or turned into jams, jellies and sauces. Pick up a pint or two at a farmer’s market and add them to your favorite summer meals. If packaged in a carton, check to make sure there are no juice stains at the bottom of the carton, or moldy or crushed berries inside. 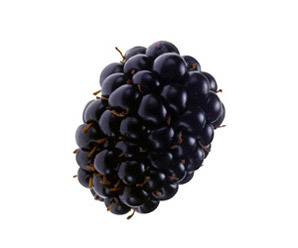 Fresh blackberries are very perishable and should be used as soon as possible after purchasing for best results. Refrigerate unwashed blackberries in a single layer covered with a damp paper towel for 1 or 2 days. Discard any moldy berries before storing. For longer storage, freeze washed and dried blackberries by placing them in a single layer on a baking pan. Freeze until hard, then transfer to freezer bags. Store frozen blackberries for up to 10 months. Remove and discard any damaged berries. Gently rinse under cold water just before using. Spread them out on paper towels to dry. Use a food processor or blender to purée blackberries for sauces. Pour the purée through a sieve before using to strain out the seeds. Good source of fiber and excellent source of vitamin C.
Sprinkle fresh blackberries over bowls of your favorite cereal or serving of BREAKSTONE’S Cottage Cheese. Toss fresh blackberries into fruit or chicken salads and top with your favorite KRAFT Salad Dressing. Add blackberries to summer smoothies and shakes. Replace one-quarter of the fresh fruit in your favorite baked pie, crisp or cobbler with blackberries. Apples and blackberries are a classic English pie filling. Layer fresh blackberries with yogurt and granola, or add JELL-O Vanilla Pudding for an irresistible breakfast or tasty dessert parfaits. Garnish Philly Cheesecake with fresh blackberries and mint sprigs. Sprinkle a tablespoon of sugar over a pint of fresh blackberries and let stand at room temperature for 30 minutes. Serve the syrupy berry sauce over scoops of vanilla ice cream.